As we head into fall, pumpkins start showing up in grocery stores and farmer's markets everywhere. With a chill in the air, it's the perfect time for a flavorful mug of hot chocolate. To give it a taste of the season, I've flavored mine with fresh pumpkin, cinnamon, cloves, oranges and maple syrup. For a finishing touch, I've added a white chocolate whipped cream and mini chocolate morsels. It's a rich and tasty "dessert in a mug" that's perfect for fall. You can certainly substitute canned pumpkin in this recipe if you like, but there's nothing better than the taste of pumpkin freshly roasted in the oven. Be sure to get a "pie pumpkin" if you do plan on roasting your own. Pie pumpkins are typically smaller than traditional carving pumpkins and tend to be thicker and denser inside. 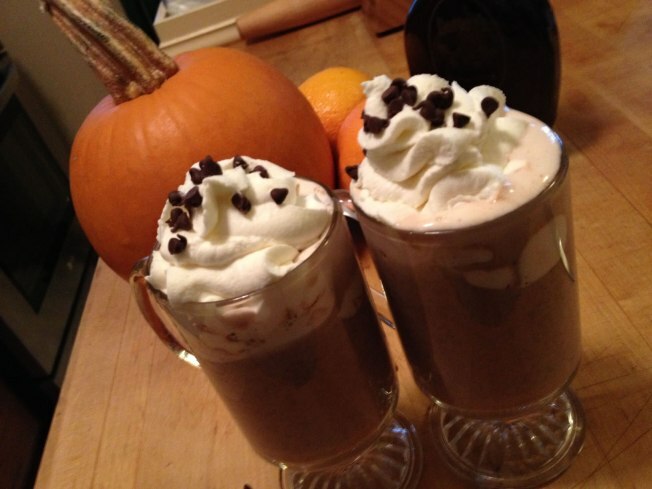 Wayne shows you how to make hot chocolate with a pumpkin twist. Put milk, pumpkin, cinnamon stick, cloves, ginger, orange zest and orange juice in a pot over medium high heat. Stir until mixture just begins to simmer. Do not let it boil. Turn off the heat and cover for 20 minutes. Place chocolate a large bowl and place a strainer on top. Reheat milk mixture until just simmering again and pour over strainer into chocolate. Remove strainer, add syrup, and stir mixture until fully combined. Pour hot chocolate into serving mugs and top with white chocolate whipped cream with mini morsels sprinkled on top. Put white chocolate and 2 tablespoons of whipping cream in a small bowl. Microwave in 10 second intervals, stirring in between, until chocolate has melted and if fully incorporated (or melt mixture in a double boiler). Place mixture in the refrigerator to cool. Meanwhile, whip cream in a bowl or stand mixture until stiff peaks form. Slowly add white chocolate mixture and powdered sugar. Spoon whipped cream over hot chocolate (or place in a sealable bag, cut a small hole in one corner and pipe whipped cream onto hot chocolate). To get the flesh from a pie pumpkin, start with about a 3-3 1/2 pound pumpkin. Remove the stem and slice the pumping in half . Using a large spoon, remove seeds and any stringy parts connected to the seeds. Separate the seeds if you want to roast them for a snack. Preheat your oven to 350 degrees F. Place the pumpkin halves cut side down in a large baking dish. Add 1/2 cup of water and 1 tablespoon of butter to the dish. Place in the oven and bake for 1 hour. Remove from the oven and tent the pumpkins with aluminum foil and set aside. After an hour or so, carefully scoop the flesh from the skin of the pumpkin and place in a food processor. Process until smooth. Store in an airtight container and refrigerate until ready to use.